In India, this ancient crop has been used as a "coloring agent", "a magic substance of daily life", "ornamental", "a substance of religious importance and medicine", "social ceremonies and rituals" in every nook and corner from birth to death, "cultural functions and folklore arts" much prior to the Indus valley civilization from ancient time are documented during ethnological survey. Turmeric is very popular among rice eating people as a condiment and spice and used as a natural dye for weaving. This magic substance is an anti-inflammatory, hypocholestraemic, choleratic, antimicrobial, antirheumatic, antifibrotic, antivenoumous, antiviral, antidiabetic, antihepatotoxic, and anticancerous. These properties are in day to day domestic use as a folklore medicine from time immemorial. 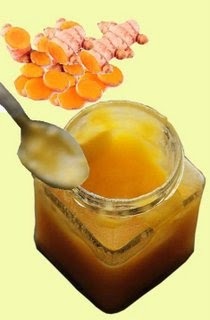 For natural beautification internally, daily intake of one inch size of fresh turmeric (kancha halud) with one teaspoon full of sugarcane jaggery (akher gur) or molasses should be followed. Turmeric should be chewed well. It purifies and nourishes the blood and skin so that the glow of health is not attenuated by blemishes and impurities but rather amplified through clarity. The classic way to apply Turmeric topically is as an Ubtan where you mix Turmeric with chick-pea flour, sesame or almond oil, a little fresh cream and honey. Turmeric was also used in the Chutti decorations on face for the famous classical dance Kathakali and Theyyam. Turmeric - this substance has various religious importances. Ancient India regarded the nature as their wealth attach considerable importance to spiritual advancement denoted as "sacred items" and good practices for health as "puja rituals". All rituals were significant about nature and health at that time e.g. necessity of availability of turmeric for the puja of sun god and sun-bath during puja rituals. In Orissa Raja Sankranti - the sowing festival, the idol is bathed in turmeric solution for purification. Shital Shasthi – the ritual of marriage festival lord Shiva and Parvati, idols are bathed after applying turmeric paste with arecanut and sandal wood daily during festival season. 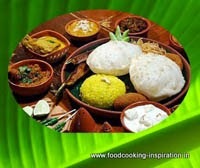 Puja offering also includes rice flakes, popped rice, coconut, roasted rice powder and toddy (a fermented drink extracted from coconut tree) along with turmeric powder. During kalamezhuthu paattu or thottem paattu in Kerala, the tilak, Karkidaka sankranthi (a malaylam festival), and Pongal – during all these harvest festivals the farmers do not allow anybody to disturb the turmeric crop before being offered to the Gods "Bhadrakali", "Muthappan", "Vishnmaya", "Ayyappan", "Chathan", and" Nagadaivam". The plant is used in Durga puja to represent nine form of Devi Durga, the nine plants (Nabapatrika) - the nine Goddesses. The Banana (Kola) plant represents Goddess Brahmani, Colacassia (Kochu) plant represents Goddess Kalika, Turmeric (Halud) plant symbolizes Devi Durga, Jayanti (Barley) denotes Kartiki, Wood Apple (Bael) denotes Lord Shiva, Pomegranate (Dalim) Raktadantika, Ashoka tree symbolizes Sokrahita, Arum plan or manaka (Maankochu) represents Devi Chamunda, and the Rice plant Goddess Lakshmi. For Kavus or sacred groves, for kalams pattu (made with turmeric, rice bran charcoal, green leaves, and raw rice powder), banyan tree ritual for Vat Savitri. It is used during Ganesh puja, to make a form of lord Ganesha by mixing turmeric with water. Gowri Habba or swarna gowri vratha for jalagauri or arishinadagauri (a symbolic idol of Gowri made of turmeric). The agri-folklore songs of Kerala namely Manjappattukal (yellow songs) and Vadakkan pattukal where turmeric are repeatedly mentioned. In Oriya this antiseptic agent is known as Krishna Kedara the ritual to protect the new born child from demons or evil sights and daily use of turmeric during Nov-Dec month to protect any person from enemies. In Kerala as a part of religious rights of hindu – poems "Thottem paattu" as a part of shakti worship offering to the goddess with the use of turmeric powder and paste. In many ghost stories in the Indian region combine with some elements the scent of burnt turmeric is also said ward the evil spirits off. 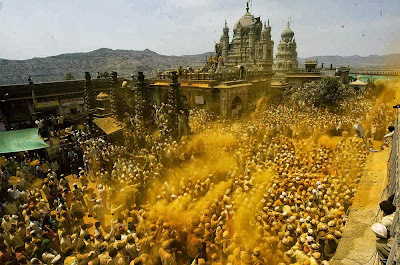 Devotees throw turmeric powder as an offering to the shepherd god Khandoba on Somavati Amavasya at the Jejuri temple in Maharashtra state, India,"the Bhandara Festivals" a six-day festival, from the first to sixth lunar day of the bright fortnight of the Hindu. The Somavati Amavasya is the day when a New Moon falls on a Monday. Upanayana - the wearing of sacred thread is washed in water mixed with turmeric paste as well as turmeric is used while wearing a new thread to exchange the old. The sister gives a little bit of turmeric in rakhi, an anklet that is tied by her around the wrist of her brothers at the time of raksha bandhan (the bond of protection) a festival celebrated in India in monsoon season. Turmeric, Pickling-lime, and durva (cynodon dactylon) helps in the healing of sprain. In trauma we always prefers to give two spoons each of Haldi (turmeric powder) and Ghee in a tall glass of hot milk. Apply paste made of fresh turmeric root in curd on cracks on heel. For blackening of face apply a paste made of curry leaf and turmeric root paste. Make a paste from turmeric root, sandal wood, ripened banyan leaf, Kottam, and sweet flag. For skin damage apply a paste made of fresh turmeric root and curry leaves. For intestinal disorders take fresh juice or dry power of turmeric mixed with buttermilk or plain water. Indian Cuisine - Turmeric as a basic ingredient. 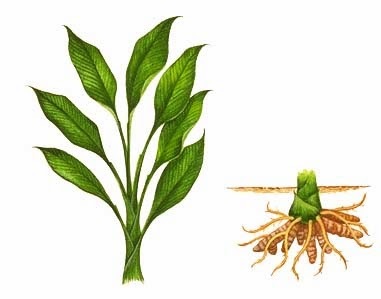 The turmeric mostly is used in the form of rhizome powder as a coloring substance and antiseptic intake. Turmeric imparts a distinctive flavor. Turmeric has bitter, pungent and astringent qualities. 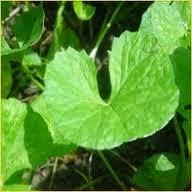 It is considered as wonder food in indigenous medical system. In some regions (especially in Maharashtra, Goa, Konkan and Kanara) turmeric used as a basic ingredient in recipes, leaves are used to wrap and cook food. This use of turmeric leaves usually takes place in areas where turmeric is grown locally, since the leaves used are freshly picked. Turmeric is mostly used in savory dishes, but is used in some sweet dishes, such as the cake Sfouf (the Lebanese yellow cake), it is made using semolina and turmeric powder. Enduri Pitha is used to prepare on 'Prathamashtami' Oriya festival. Konkani Patholi or Arasina Yele Kadabu, a sweet dumpling used to steam in Turmeric Leaves. International cuisine – Turmeric as a basic ingredient. Although typically used in its dried, powdered form, turmeric is also used fresh, like ginger. It has numerous uses in Far Eastern recipes, such as pickle made from fresh turmeric that contains large chunks of soft turmeric. Turmeric (Khmer) is grown in Battambang province and is a common ingredient in many curry powders, soups and rice dishes. Saffron is also esteemed in local folk medicine as a treatment for many ailments, especially skin problems. Turmeric is widely used as a spice in South Asian and Middle Eastern cooking. Many Persian dishes use turmeric as a starter ingredient. Almost all Iranian fried dishes consist of oil, onions, and turmeric followed by any other ingredients that are to be included. In Nepal, turmeric is widely grown and extensively used in many vegetable and meat dishes for its color as well as for its potential value in traditional medicine. In South Africa, turmeric is used to give boiled white rice a golden color. In Vietnam, turmeric powder is used to color, and enhance the flavors of, certain dishes, such as Bánh Xèo, Bánh Khọt and Mi Quang. The powder is also used in many other Vietnamese stir fried and soup dishes. In Indonesia, Minangkabau ethnic group of Indonesia, the turmeric leaves are used for Minangese or Padangese curry base of Sumatra, such as rending, sate Padang and many other varieties. In medieval Europe, turmeric became known as Indian saffron because it was widely used as an alternative to the far more expensive saffron spice.